ACLAÍ’, pronounced ‘ack-lee’ is the Irish word for fit, or athletic. We are a personal training company located in the Crawford Business Park in Cork City, and we have been in operation since 2013. We are passionate about what we do and how we do it, and over the last 6 years, we have helped hundreds of members reconnect with their health, and established ourselves as a leading force in our field. Check out the page below to read a bit more about our story, our approach, and how you can get involved. Our mission at ACLAÍ is to provide a world class service and help our members achieve their goals. The first cornerstone of our approach is to Coach Quality Movement. The first step in our training process is to build a training program that fits the needs of each individual member based on how they are moving and what their goals are. While our members have a wide range of goals individually, we always have universal goals for our members of; learning HOW to train, so that members learn how to train with perfect technique and in a way that suits them, and; learning new skills and developing strength and mobility through our personalised programs so that members are able to perform exercises and challenges that the hey were not able to do when they started training with us. We limit the number of members at our facility for each hour to ensure that you get the attention, coaching, and guidance you need to improve with each session. The next cornerstone of our approach is to encourage Real Food for Real Life. Positive, sustainable, and fulfilling nutritional habits are an essential part of long term health, and as you can read in more detail, we work hard to help our members achieve this. We believe that Creating Positive Change is an essential function of any business, and we strive to do this within our immediate community and further afield. See details of our social awareness and solidarity initiatives below. Lastly, we always make the effort to Lead By Example when it comes to our approach. if we don’t believe in something, we wont bring it into our training system, and we follow our own teachings at ACLAÍ as best as we can. The ACLAÍ Team is led by Managing Director and Head Coach Ainle Ó Cairealláin. 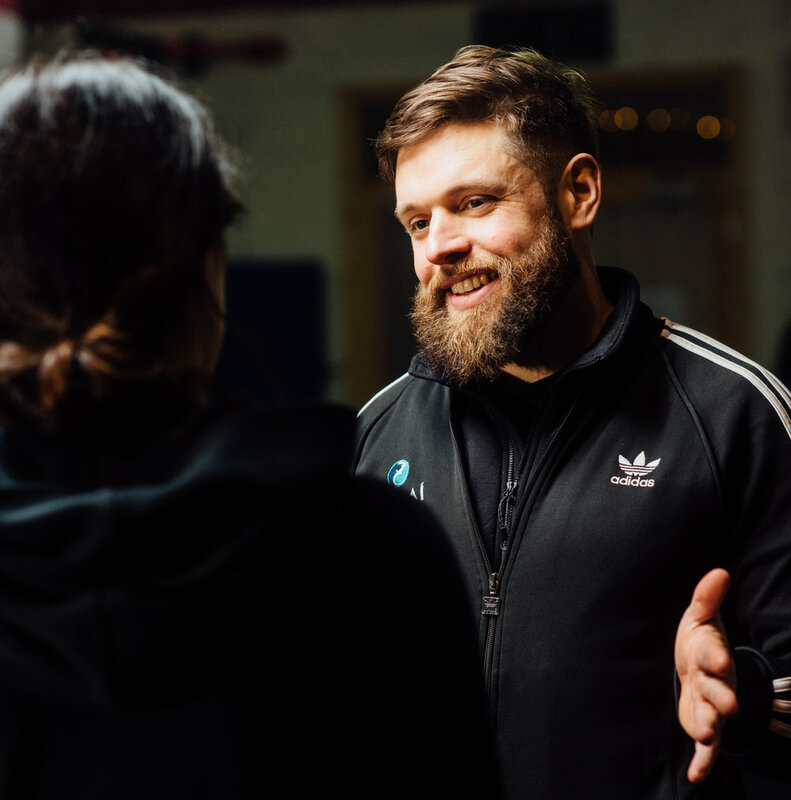 Ainle’s academic experience includes a Bachelors degree in Sport and Exercise Science, and a Masters degree in Biomechanics from the University of Limerick. He is also a Certified Strength and Conditioning Specialist, and Certified Special Population Specialist (NSCA). Alan Dinnen, and Baptiste Vergé are on the Coaching team at ACLAÍ. 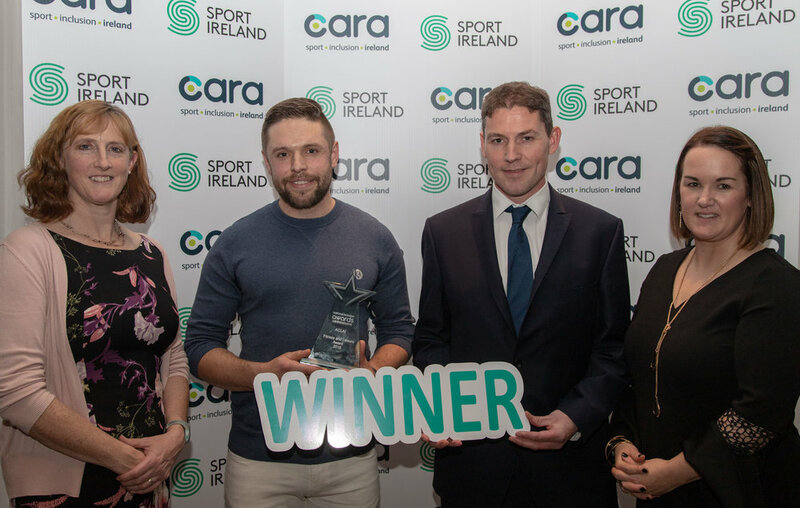 Alan is currently completing a degree in Strength and Conditioning in Setanta College, and plays wheelchair rugby for Ireland. Baptiste holds a Bachelors degree and Masters degree in Sports Science. Stephanie Léygonie is the newest member of the team having joined us in March 2018, looking after admin and customer service. Find out more about the ACLAÍ Team here. Our training approach is influenced by the world of strength and conditioning, gymnastics training, Olympic weightlifting, power lifting, bodyweight training, movement training, kettlebell training, and additional methods that we have been exposed. It boils down to providing our members with a program that fits with their individual goals and level of ability, and allows them to progress in the most effective way. Our training sessions are generally 60 minutes long, and are always under the guidance of an ACLAÍ coach. Each member at ACLAÍ has their own individualised training program. Most of the training is performed with a maximum of 4 members and 1 coach, so that every members gets the coaching and attention that they need to improve in every session. We also do some 1-1 coaching, depending on your needs as a member. To discuss the best option for your own personal training, book a consultation using the link at the bottom of the page. People who have restricted mobility issues due to medical conditions or disabilities. Our membership has ranged from the Cork Senior Football team, national and international level athletes in various sports such as triathlon, running, and swimming, clients with varying levels of disability, hip and knee replacements patients, post -back operation patients, any many more people in-between whom we were able to help achieve their goals. It is a great pleasure for us to be able to work with such a wide vairiety of members at ACLAÍ. We also strive to provide a social outlet with regular get togethers and meet-ups at our facility and also outside. We have a regular book club that meets on the last Thursday of every month. To join in with the book club, all you have to so its come along to one of the meet-ups, borrow a book from our library, swap a book with another member, or just bring along whatever book you are reading athletes the moment. The main idea behind the book club is to get together to swap thoughts, ideas, and books, as opposed to the traditional book club set up where everyone has to ready the same book. We also hold regular movie nights and have also started to hold small arts and crafts get-togethers in our social space. Last year we set up a WhatsApp group for all past and current members to be able to organise meet-ups and get-togethers independently. in 2018 we held our first major fundraising event with the inaugural Gym Jam, and raised over €6000 in aid of the Irish Wheelchair Rugby Team, who qualified for the World Championships in Sydney Australia for the first time, but received little to no state funding for their trip. This year, we have undertaken to open a volunteer gym in the West Bank, Palestine. This project came about after 2 visits to the camp by Ainle, and to help address the health problems being faced by the people of Aida on account of their cramped living conditions and the ongoing oppression from the Israeli army that surround the camp 24/7. 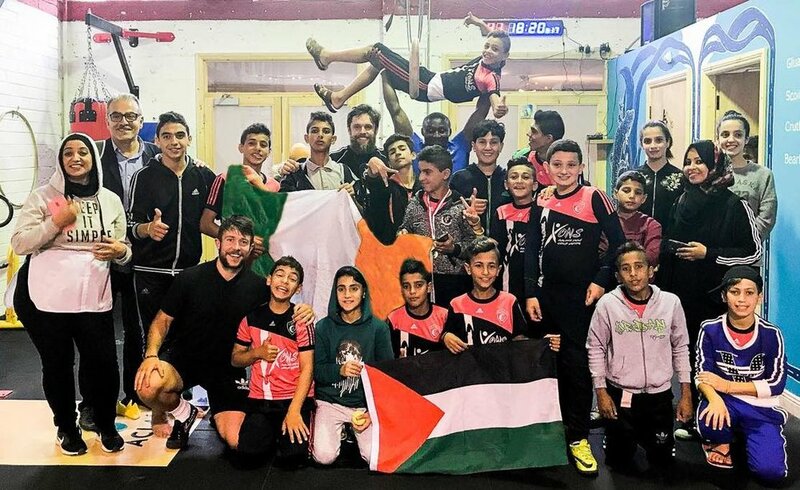 The main fundraising events for this project include a pop up shop selling handmade Palestinian goods from the West Bank (December 2018), Gym Jam 2019 (July), and the GoFundMe campaign (search West Bank Gym on GoFundMe). in 2018, we also joined the campaign for free sanitary products for women to combat the ongoing issue of period poverty, as well as raising awareness around other local and national issues that are close to our hearts whenever we can. A major our appraoch at ACALÍ is centered around providing equal opportunities for all of our members to participate regarldless of level of ability of disability. As we see it, inclusion doesn’t mean a special place in the corner for people with disabilities to do a bit of exercise. It means communication on an equal footing, participation together with an equal challenge, and dicovering the many similarities that we all have and how they far outweigh the differences between us. ACLAÍ is an open, inclusive, and friendly training facility, and we have the expertise and experience to help you build strength and mobility, and enjoy a challenging and rewarding training program. From our physical location, our training facility, equipment, coaching staff, and training programs, we go the extra mile to make sure that our services are offered on a equal basis to every single one of our members. Over the last 6 years, we have a built a strong connection with many physiotherapist, GP's and a select few consultants in Cork who refer patients to us for rehabilitation work after injury or operation, and people who need a helping hand to get fit for medical reasons. We communicate with all referring physicians on a regular basis to provide updates on how their patients are doing, and work hard to maintain very high standards of service and communication. We believe that the development of these referral pathways is both an endorsement of our professional level of service, and also an invaluable resource for both referring physicians and patients alike. Since starting the ACLAÍ project in 2013, we have established ourselves as a national leader in the field of personal training, become well known for our inclusive approach to training and the development of new training systems that allows people of all abilities to train together on an equal footing, and become a trusted service provider for GP’s, physicians, and medical professionals to help patients with their health and fitness. We are very proud of the social awareness initiatives that we have back over the last number of years, our contribution to our city, the community of members and past members that has grown around our facility, our ever developing coaching expertise and approach, and also our positive approach to helping our members and promoting our business. Since starting, we have been awarded Gradam Uí Chuannacháin from Gael-Taca for our contribution to the development of the Irish language in Cork, a National Inclusion Award from CARA for our pioneering work in training people with varying levels of disability, and most recently a national Business All-Star Award for our best in class service. Your Consultation is free of charge, and you are under no obligation to sign up to one of our programs. All we ask before you book is that you are serious about getting results from your training, and are ready to start working towards them. You can also check out the events page for upcoming get togethers, and come along to the next one!